In 1885 G.T Rope published an article in The Zoologist ‘On the range of the dormouse in England and Wales’ (Vol 9 No. 102 pages 201-213). This showed that dormice were considered ‘common’ in many of the southern counties (shaded red) and known localities were recorded in many of midland and northern counties and Wales (shaded pink with locations shown as yellow dots) . This general dormouse distribution in the early 1900’s was supported by Victoria County Histories (1907) and other naturalists. 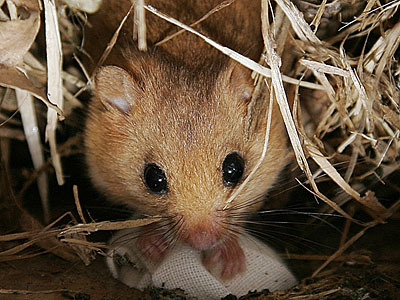 Ecological studies were undertaken on dormice during the 1980’s by Pat Morris and Paul Bright but their national distribution at that time was unknown. In 1993 a public survey was organised to find and identify hazelnuts eaten by dormice. This survey was repeated in 2001. The results, shown in the map below (yellow and orange dots are positive records, blue dots are negative records) demonstrated that in less than 100 years dormice had been lost from many counties and were predominantly concentrated in southern England and the borders.